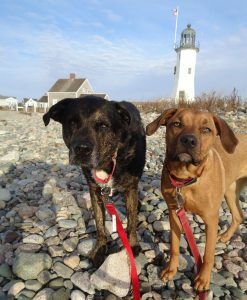 In January 2017 Shadow and I Adventured to the Stonington Harbor Lighthouse in Stonington, Connecticut. The Lighthouse was built in 1840. It no longer is a working Lighthouse, but is now open as a museum. We had a special Adventure to the Stonington Lighthouse, one of our many stops on a fun-filled day of exploring. My throwback memories are not always as vivid as I hope they would be, however I remember enjoying the visit on a frigid day. The Lighthouse was in a little harbor neighborhood. It was surprisingly made of stone, quite the charming structure. We posed for some photographs and ambled around for a bit. We were pleased to have the entire spot to ourselves, definitely an off season perk. Always a special day with my Shadow. Today we Adventured to Gillette Castle State Park in East Haddam, Connecticut. This was our second trip to the Gillette Castle. Gillette Castle was once the estate of William Gillette, a famous Actor in the early 1900’s. It was later bought by the state of Connecticut. The Park includes a visitor center, museum, hiking trails, and picnic area. There are even live theater events and walking tours available to visitors. We had an intriguing Adventure to Gillette Castle State Park. Our first visit was in August 2018, on a warm day, while today was a overcast, almost chilly Fall day. Gillette Castle State Park is a magical experience, transforming visitors back into medieval time, or sensing an escape on a journey abroad. We greatly enjoyed our visit to the Castle, circling the grand structure many times so as not to miss an inch. Shadow enjoyed some rolls in the grass, while Wilma jumped up high to climb along the rock-like fence, posing for photos. Not only is the Castle itself just breathtaking, it is located on the beautiful Connecticut River vast with Fall foliage. Just gorgeous from every direction! Today the Castle was mobbed with visitors, dulling the experience a bit, but really that cannot take away from the brilliant beauty of the Castle. After visiting the Castle we wandered the trails on the side of the Park, and headed down to the water. Shadow and I were a bit tired from our earlier Adventure so we decided not to engage in any strenuous or lengthy hiking. The trails were not labeled, so we just sauntered around for a bit. We were thrilled to locate three adorable walking bridges along the way, adding some charm to the trails. From the trails we walked around some spots along the main road, finding a gorgeous stone bridge, a leaf filled pond, and several other small features along the way. We of course had to have one last visit to the Castle before finishing up our day. Although I wish we could have had this spot all to ourselves (haha), we still cannot say enough about the spectacular Gillette Castle State Park. I expect we will be back again in the future (Rating: 5). Today Shadow, Wilma, and I Adventured to Wadsworth State Park in the towns of Middlefield and Middletown, Connecticut. The park is a 285 acre park filed with trails, fishing, swimming, mountain biking, and two waterfalls. It is located on the Coginchaug River. Clarence Wadsworth, a well known Colonel, linguist, and scholar developed the land in order to preserve it for all citizens, therefore earning the name. We had a delightful Fall Adventure to Wadsworth State Park. Although the day was dark from previous rain, and the temperature crisp, it was just perfect for a hike. We were excited to explore a Park in Connecticut, a place we have not frequented as much as the remaining New England states. Upon exiting the car we could immediately hear the roaring of the “Big” Falls. Although I had printed a map, we quickly found a large map which we viewed before heading straight to the “Big” Falls. The “Big” Falls was thunderous, and quite spectacular. It is hard to know what to expect when you plan a visit to a waterfall as sometimes they can be practically non-existent, especially in off season. The “Big” Falls, however did not disappoint, as it was heavy flowing, and music to our ears. The ground was covered with gorgeous Fall leaves adding the perfect touch to the lovely scene. After viewing the “Big” Falls we searched for the trailhead. It took us awhile to finally find this location as we had to walk down the main street before eventually coming to the sign. A brief moment of frustration, but we soon were off on our way. We hiked all over this magnificent Park, the leaves yellow, red, and brightly patterned. There were numerous trails and turns, requiring constant peaks at the map. So lucky I had printed the map so we did not miss any highlights, and could not worry about getting lost. So with this map we headed to the “Little” Falls, which was less then a mile down the orange trail, and off onto the blue trail. Another marvelous waterfall this one had less flow, and more rocks, yet gorgeous in its own way. We spent a bit exploring the “Little” Falls, while the pups enjoyed some fresh flowing water. In August 2017 Shadow, Wilma, and I Adventured to the Comstock Covered Bridge in East Hampton, Connecticut. The Comstock Covered Bridge was built in 1840, and is approximately eighty feet in length. It crosses the Salmon River. The Comstock River Bridge is one of only three historical covered bridges in Connecticut. It is open to pedestrian traffic only. We had a lovely Adventure to the Comstock Covered Bridge. We were especially enthused as it was the first day that Wilma had Adventured to Connecticut! We found parking near the Bridge, and began exploring the area. The Comstock Covered Bridge is on the edge of the Salmon River State Park. (We only briefly explored the park, so I will not blog about the Park specifically.) Our journey began on and through the bridge as we walked back and forth, enjoying the views of the River and the Truss architecture of the Bridge. From there we headed down to the sandy shore to view the Bridge from the side. Shadow and Wilma posed as though they were in awe of the Bridge, and of course I attempted some family selfies. We then followed the trail along the River for a bit, stopping for some Shadow swims. We quickly found a path down the River edge to hop along the rocks and to sit, relax, taking in the scenery. The area was overall quiet, with a few visitors here and there. We enjoyed our journey to the Comstock Covered Bridge, and may return in the future to thoroughly explore the Salmon River State Park (Rating: 3). On May 27, 2017 Shadow and I journeyed to Campbell’s Falls in Norfolk, Connecticut. (Wilma had not yet joined our world). Campbell’s Falls is located in the Campbell Falls State Park Reserve. It cascades nearly 100 feet, and is a part of the Whiting River. The Whiting River starts in Massachusetts, and the waterfall lands into Connecticut. We visited the Campbell’s Falls at the end of a full day of adventures (hence the end of the video). We found a parking lot that led us to a short, but steep walk to the Falls. The Falls was absolutely breathtaking. The roar of the water, the mist of the Falls, and the singing of the flowing brook led to a true nature experience. We sat by the brook for a bit, and relaxed, taking in the sounds, smells, and sights. We then climbed halfway up the waterfall, taking some photos in the perfect little spot. I love finding landmarks of nature that provide the full sensory experience, and this definitely was one of those moments. The Campbell’s Falls was one of the most beautiful waterfalls I have seen, and I highly recommend a visit (Rating: 5). Today we visited Mansfield Hollow State Park in Mansfield, Connecticut. The Mansfield Hollow State Park is a State Park in Connecticut, and is considered a “recreation area”. The Mansfield Hollow Lake is approximately 500 acres, and there are 251 acres of recreation area on the western edge of the Lake. Popular recreational opportunities include: hiking, dog walking, fishing, boating, mountain biking, and cross-country skiing. There is no fee to enter the Park, quite the perk for a social work budget. Immediately on arrival our eyes were drawn to the beautiful blue, sparkling water of the Mansfield Hollow Lake, as a refreshing cool breeze lightened the air. Gazing over the Lake we viewed many canoes, kayaks, and fisherman. We found a trail near the boat launch, and began wandering the trails, many parallel to the Lake. The scenery varied from beautiful lake views, raised trails, footpaths winding throughout the woods, to even fields with bright colored, tiny, wild flowers . There were many families enjoying an afternoon picnic, and dogs strolling down the trails. Throughout the day we stopped several times to sit in the shade and relax. Shadow and Wilma enjoyed rolls, and naps in the bright green grass. The Park appeared quite immense, providing many quiet, uninterrupted spots to lounge and enjoy. We spent about three hours exploring the Mansfield Hollow State Park. The dog rules were not clear, nor stated, but we did our best to observe those around us. However, on our second stop at the park (which appeared to be the main parking lot), we noted a sign indicating dogs must be leashed. We then” leashed-up” and continued exploring (so we do apologize for this overlook.) It was a warm, yet relaxing day at Mansfield Hollow State Park (Rating: 4). So this brings me to the end to our Two Day Connecticut getaway. We had a wonderful time exploring, and look forward to our next new Adventure. Evidence of a successful vacation can be seen below, the best travel buddies I know!